Liverpool boss Brendan Rodgers is confident that there is more to come from new signing Lazar Markovic, who has joined the Reds from Benfica. The 20-year-old Serbia international has penned a long-term contract at Anfield after the clubs agreed a deal worth in the region of £20million. He is the sort of character who is hungry to get better and progress. 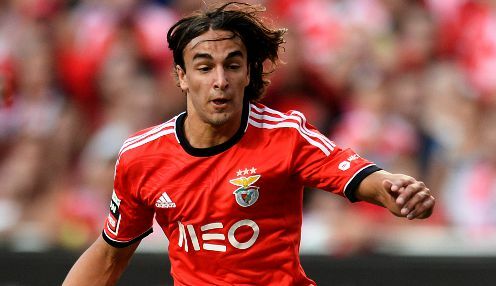 Winger Markovic had only been with Benfica for one season, having started his career in his homeland with Partizan Belgrade. And Rodgers believes that his club have secured the services of a player on the rise, with Liverpool having snapped up Adam Lallana, Rickie Lambert and Emre Can already this summer. He told the Reds' official website: "This is an exciting signing for us and one that improves our squad, in terms of attacking options, for the coming season. "Lazar is flexible to play a number of positions, but I like the way he attacks games and is always positive and looking to make something happen. "Getting him at such a young age is also very pleasing for us, because we will be able to work with him to develop his talent. He is the sort of character who is hungry to get better and progress." Liverpool, who finished second in the Premier League last season, are 1/1 to be crowned champions in 2014/15, with Manchester United 1/1 and Manchester City 1/1.